"This is the first evidence of helping behavior triggered by empathy in rats," said Jean Decety, PhD, Irving B. Harris Professor of Psychology and Psychiatry at the University of Chicago. "There are a lot of ideas in the literature showing that empathy is not unique to humans, and it has been well demonstrated in apes, but in rodents it was not very clear. We put together in one series of experiments evidence of helping behavior based on empathy in rodents, and that's really the first time it's been seen." "On its face, this is more than empathy, this is pro-social behavior," said Mogil, who was not involved in the study. "It's more than has been shown before by a long shot, and that's very impressive, especially since there's no advanced technology here." The experiments, designed by psychology graduate student and first author Inbal Ben-Ami Bartal with co-authors Decety and Peggy Mason, placed two rats that normally share a cage into a special test arena. One rat was held in a restrainer device  a closed tube with a door that can be nudged open from the outside. The second rat roamed free in the cage around the restrainer, able to see and hear the trapped cagemate but not required to take action. The researchers observed that the free rat acted more agitated when its cagemate was restrained, compared to its activity when the rat was placed in a cage with an empty restrainer. This response offered evidence of an "emotional contagion," a frequently observed phenomenon in humans and animals in which a subject shares in the fear, distress or even pain suffered by another subject. While emotional contagion is the simplest form of empathy, the rats' subsequent actions clearly comprised active helping behavior, a far more complex expression of empathy. After several daily restraint sessions, the free rat learned how to open the restrainer door and free its cagemate. Though slow to act at first, once the rat discovered the ability to free its companion, it would take action almost immediately upon placement in the test arena. "We are not training these rats in any way," Bartal said. "These rats are learning because they are motivated by something internal. We're not showing them how to open the door, they don't get any previous exposure on opening the door, and it's hard to open the door. But they keep trying and trying, and it eventually works." To control for motivations other than empathy that would lead the rat to free its companion, the researchers conducted further experiments. When a stuffed toy rat was placed in the restrainer, the free rat did not open the door. When opening the restrainer door released his companion into a separate compartment, the free rat continued to nudge open the door, ruling out the reward of social interaction as motivation. The experiments left behavior motivated by empathy as the simplest explanation for the rats' behavior. "That was very compelling," said Mason, PhD, Professor of Neurobiology. "It said to us that essentially helping their cagemate is on a par with chocolate. He can hog the entire chocolate stash if he wanted to, and he does not. We were shocked." "This model of empathy and helping behavior opens the path for elucidating aspects of the underlying neurophysiological mechanisms that were not accessible until now." Bartal said. 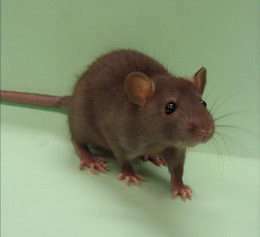 The experiments also provide further evidence that empathy-driven helping behavior is not unique to humans  and suggest that Homo sapiens could learn a lesson from its rat cousins. "When we act without empathy we are acting against our biological inheritance," Mason said. "If humans would listen and act on their biological inheritance more often, we'd be better off." More information: The paper, "Empathy and pro-social behavior in rats," will be published Dec. 9 by the journal Science. Cool, I suspect we will find that most mammals and even other higher order animals have some sense of empathy. Vampire bats also exhibit remarkable empathetic and altruistic behaviors. I'd be curious to know if they tried this with two rats that have a fiercely antagonistic relationship ? Would they leave their enemies in lockup ? Also, it'd be interesting to try this with wild rats that have not had direct human contact or as little handling as possible. I oft wonder if there is a stumbling block in using animals that are hand-raised for testing natural intelligence/social dynamics..
No question about it in my mind. Rats, rodents, bats and wolves have been demonized by the films of Hollywood, who have done animal conservation a great disservice. Meerkats exhibit social behavior that humans supposedly have. Little bodies with huge hearts. Lovely piece of research. It's surprising that these findings hadn't been observed before, given how ubiquitous is research with rats. Just goes to show how our many and varied sophisticated behaviors are simply embellishments built of existing and widespread 'primitive' behaviors shared by many other organisms. I wonder if this was controlled for sounds the restrained animal was making. Could it be that the other rat just finds the noise annoying or distressing and is basically thinking "Alright I'll let you out, so shut up already!" rather than acting out of empathy? You mean just like the mechanism that makes parents try to pacify their kids? Individual rats. Social interactions of rats hasn't been much on the agenda of behavioral scientists (for that they like to use ants, bees or monkeys). But this is not an exact description of the video. These rats are laughing even when they play mutually each other like kids in the kindergarten - they're happy from invisible jokes and gestures, which they're doing during this. They do share their enjoyment in highly social way, we just cannot recognize it. They're acting randomly like some extraterrestrial intelligence for us - and we are probably perceived with rats in the same way.